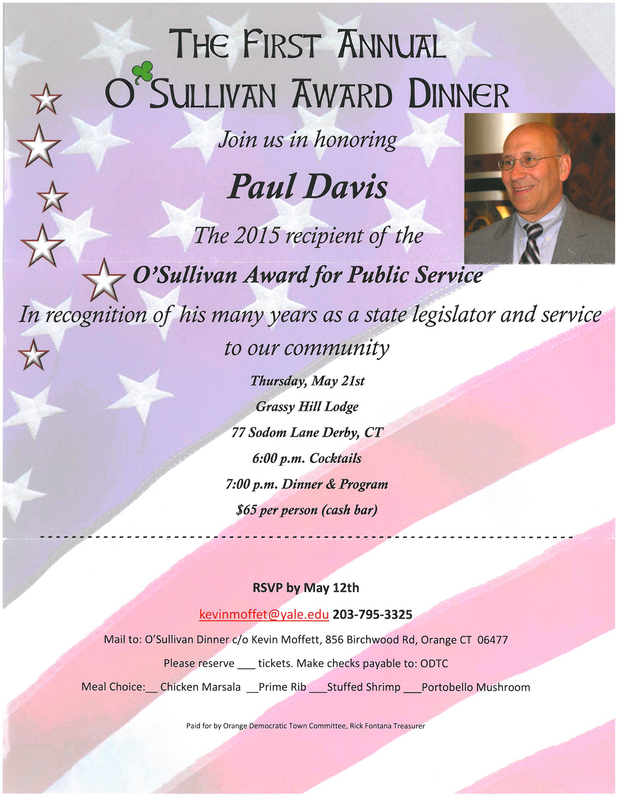 Paul Davis, former State Representative of the 117th House District, will be honored at the First Annual O’Sullivan Award Dinner. Davis will be the recipient of the “O’Sullivan Award for Public Service”. The award dinner is slated to be held on May 21st, 2015 at the Grassy Hill Lodge on 77 Sodom Lane in Derby, Connecticut. Cocktails start at 6pm and the Dinner & Program starts at 7:00pm. 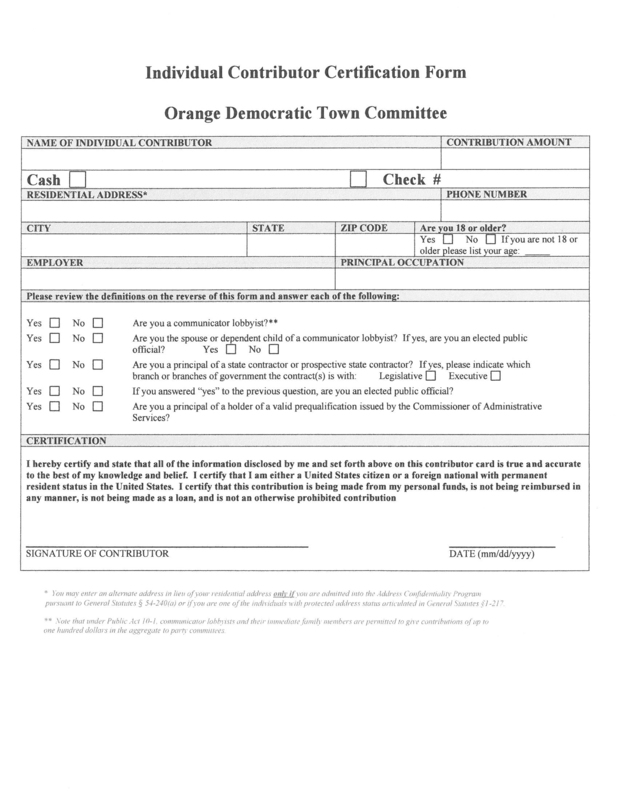 Organizers from the Orange Democratic Town Committee are asking $65 per person and to RSVP by May 12th. Please see the attachments below in this post. You will find the formal announcement flyer with details on RSVPing, the commemorative ad book form for the dinner and a contribution certification form. You can RSVP by contacting Kevin Moffett at kevinmoffet@yale.edu or calling 203-795-3325. Should you have any questions Mr. Moffett should be the person you reach out to as well. Congratulations to Paul Davis. Well deserved. 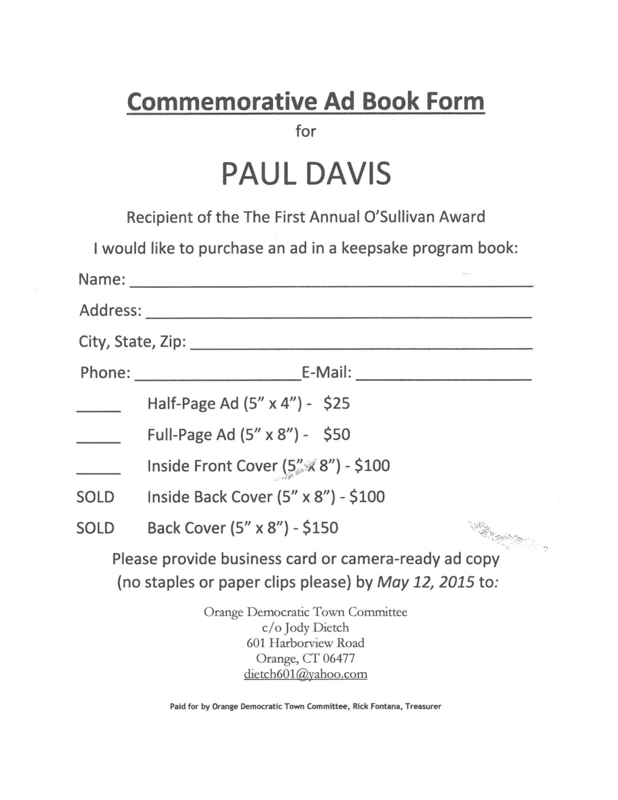 This entry was posted in News and Events and tagged 117th House District, Awards Dinner, Connecticut., Derby, O'Sullivan Awards Dinner, Orange Democrats, Paul Davis, Public Service. Bookmark the permalink.